Pino Lella wants nothing to do with the war or the Nazis. He’s a normal, Italian teenager—obsessed with music, food, and girls—but his days of innocence are numbered. When his family home in Milan is destroyed by Allied bombs, Pino joins an underground railroad helping Jews escape over the Alps, and falls for Anna, a beautiful widow six years his senior. 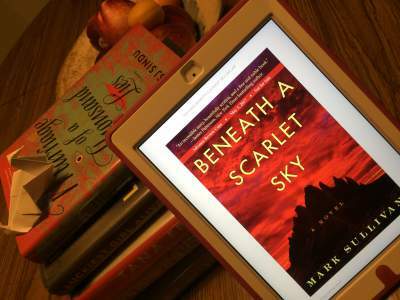 Beneath A Scarlet Sky by Mark Sullivan is a historical fiction novel based on the true life of Pino Lella during World War II. I thoroughly enjoyed this book. Here’s why it was so good! When it comes to historical fiction, I find that the writing style can tend to be a bit heavy. 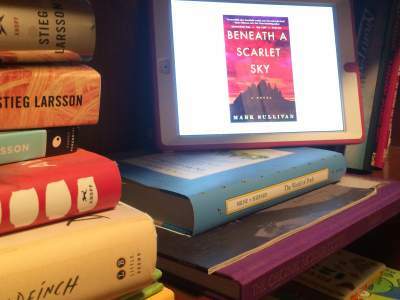 This was not the case with Beneath A Scarlet Sky. The book read more like a thriller, with some parts that were descriptive. Pino’s story was nicely paced and I got drawn into his world being in the mountains and helping the Jews escape to Switzerland; and then as a spy working for General Hans Leyers. The action and pace of the book made me want to know what would happen to Pino. Each aspect of his life, from the beginning to the end, was fascinating. What is so remarkable about the book is Pino’s story. 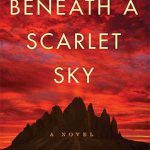 This historical fiction was based on real people during World War II in Italy. It definitely makes an interesting read when the hero of our story is only a young boy when he starts helping against the Nazis persecution of the Jews in Italy. Pino Lella is an incredible person. What a wonderful and powerful story he has. At 18, Pino was chauffeur to the Nazi High Commander General Leyers and took risks as a spy, because of his convictions. Even some of his family and friends did not know he was a spy. Because of this, Pino suffered emotionally, as he was seen as traitor and a Nazi lover. I liked that the novel is set in Italy. Every country has its unique experience with World War II and it’s nice to read about Italy. We hear so much about resistance to the Nazis in other countries, but not so much in Italy. The people in Pino’s life were all interesting and I could imagine him and his relationship with his family and friends. Pino Lella is morally strong, courageous and an overall decent guy. It takes courage to stand up for what you believe in and Pino had that courage. He acted in accordance with his beliefs; and though at times, he felt he didn’t have the strength to be brave, he looked to his faith and Father Re for guidance. I was moved by Pino’s bravery, as he was so young. Pino first trained his body by walking the mountains, so he could get fit. He then worked as a guide, helping the Jews across the Alps into neutral Switzerland. The mountains were treacherous and he faced many physical challenges, alongside the threat of being discovered and shot. Father Re was the remarkable mentor, who got Pino started on his journey to help the Jews escape Fascist Italy, during German occupation. Anna, who Pino fell in love with, was also an interesting character. She helped give Pino strength when he needed it, and assisted him with some of his missions. Best Part Of The Book? One of my favorite parts of the book was when Pino saved the pregnant lady, as she crossed over the mountains to Switzerland. You can really see what sort of person he is in that moment. I also liked the ending of the story, thought it was sad and cruel. With the withdrawal of the Nazis from Italy, there were many public revenge killings and many Italians acted savagely. This part of the book was a revelation that surprised me. The ending was also poignant. Pino didn’t get all the answers to his questions. There are some mysteries that he will never know, like how General Leyer knew Pino’s code name: Observer. Mark Sullivan is a master storyteller who will transport you into the inspirational and courageous life of Pino Lella in Italy, during World War II. Filled with powerful messages and altruism of the human condition, I would highly recommend it. Fans of All the Light We Cannot See by Anthony Doerr will definitely enjoy this novel. Original published on Arlene’s Book Club. Lightly edited for Native English fluency, brevity, and flow. 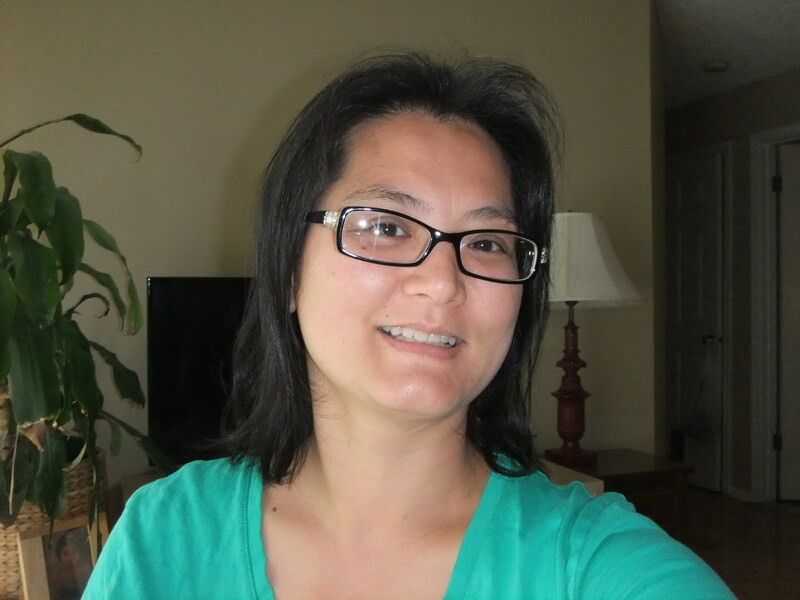 Dinh is a co-founder of Arlene’s Book Club. Dinh overcame her challenges with English as her second language, to become a bookworm by her late 20s. She especially enjoys science fiction and fantasy novels. *Synopsis from Kindle version, 526 pages, copyright 2017, and published by Lake Union Publishing. Many thanks to NetGalley for my review copy. This book sounds incredible! This normally isn’t the kind of novel I’d go for, but your review made me want to check it out. Awesome! Superb review, you have really drawn me in. Enough so to want to go and check it out on Amazon and put it in my basket….or download. I have already fallen for the main charachters. Thanks very much for following my blog, it is appreciated.